Not from Grant Morrison’s The Filth . 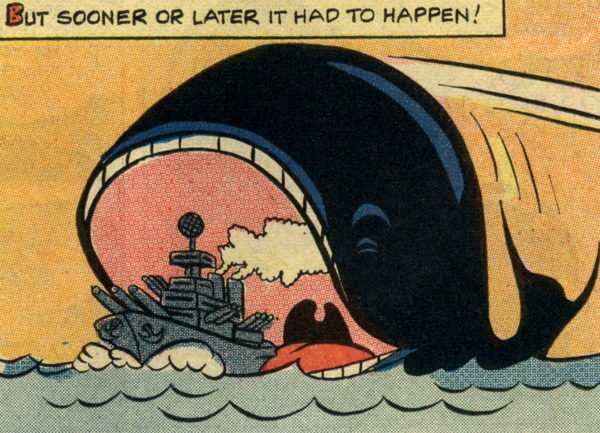 I feel like the funny animal potential for whales hasn’t been fully exploited. I mean, sure, there’s this, and I’m probably not remembering comic strip characters and such. But I think we can agree “whales” are far behind “dogs,” “cats” and probably “anteaters” in the Humorous Representation of Animals catalog. I would absolutely wear Charlton-branded clothing if such a thing existed. 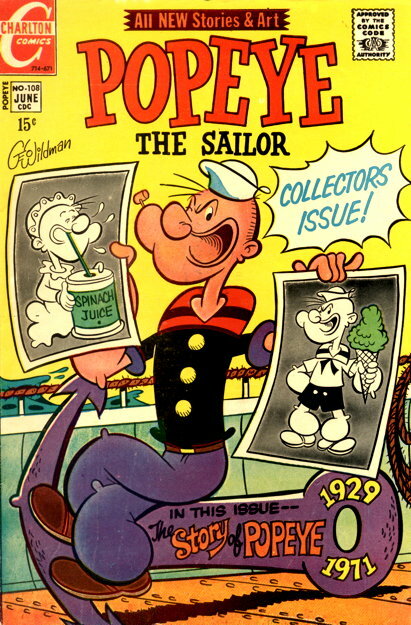 Now, I may have mentioned at some point that I’m a fan of the Charlton Comics era of Popeye comics, from the late ’60s into the ’70s, and I tend to keep ’em for myself on the rare occasion one happens my way in a collection. However, this issue, I just couldn’t wait for the tides to drop one on my shores…I sailed out into the internets and netted my very own copy. Alas, ’twas not the case, which means this comic I talked about a while back still stands as the only definitive fictional biography of the one-eyed (or is he) sailor man. 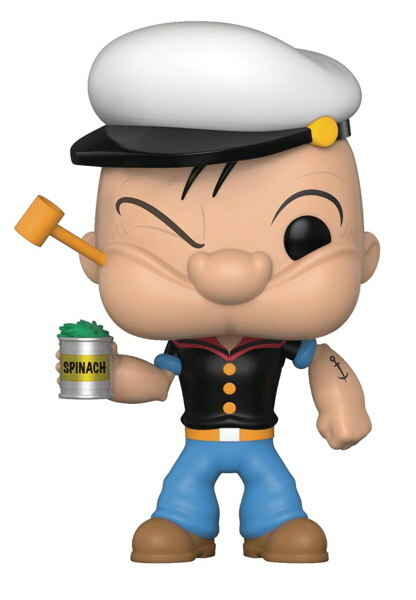 …but it sort of glosses over the fact that Popeye had appeared in a strip that had already been running about ten years by the time he showed up. 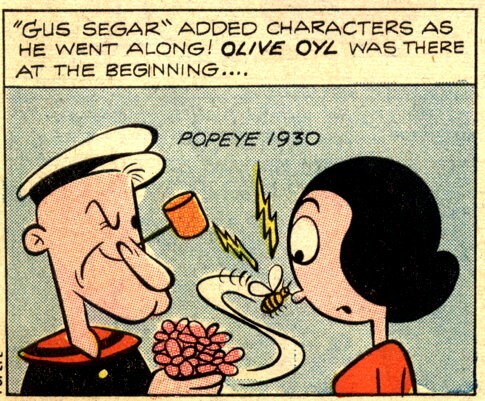 And that Olive wasn’t just “there at the beginning” of Popeye’s introduction, but preceding his appearance entirely. Darn your lackadaisical scholarship, nearly-50-year-old Charlton comic! 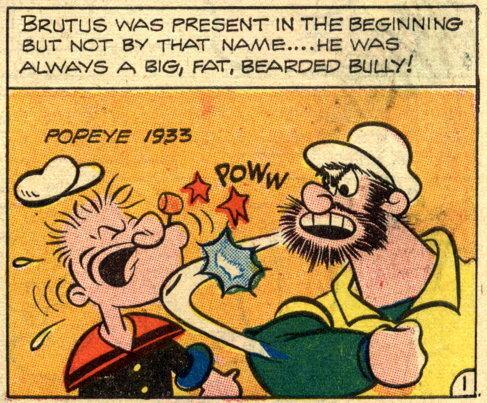 …though the name “Bluto” isn’t actually mentioned, but I’m sure a kid interested enough in Popeye to read comics about him probably knew it from the original cartoons. …wearing of course the official Charlton Comics work shirt issued to all employees of the company at the time. Writer Joe Gill even gets a namecheck for himself in there, which is a nice reminder that this comic wasn’t the one-man show I’d assumed. And that’s pretty much it for “The Story of Popeye,” as the next three pages are a short…um, well, Popeye story where Brutus abducts Olive and Popeye goes to the rescue and there’s fisticuffs and mayhem and it’s pretty much just a small, simple quintessential example of what Pipeye, Peepeye, Poopeye and Pupeye’s uncle is all about. 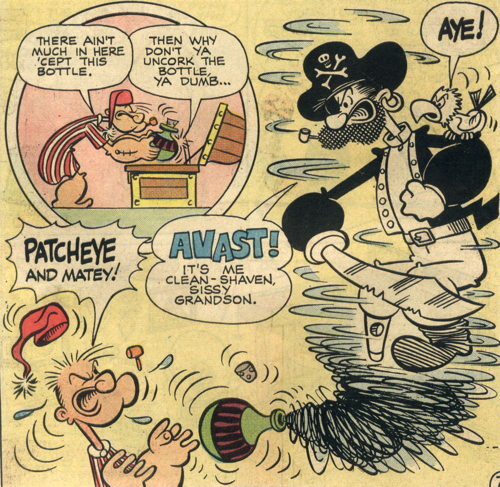 Again, that last splash is a wonderful drawing…I’ve written before about how the Charlton Popeye will, despite its apparent simplicity, occasionally surprise you with its artistry. I was hoping there would be some eventual comprehensive reprinting of this run, like the recently concluded IDW series featuring the Bud Sagendorf comics, but I guess there just isn’t enough money in it. 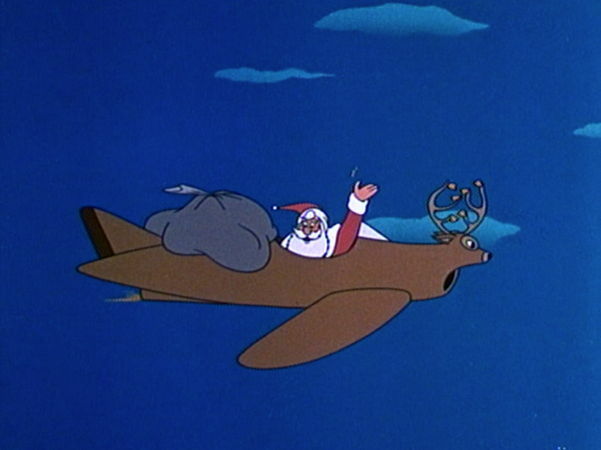 That’s a shame, because the world could always use more recovery of classic cartooning, and not just have it relegated to the forgotten back issue bins and dusty attics of history where only oddballs like me can appreciate it. 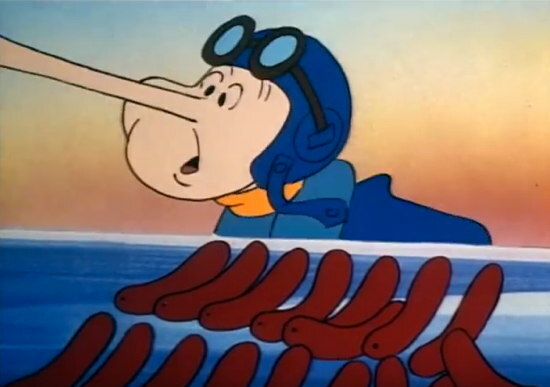 So, always on the lookout for the latest and freshest Popeye news as I am, I spotted this story about a company about to debut brand new cartoons starring our favorite rough ‘n’ tumble one-eyed sailor with a heart of gold on his official YouTube channel. 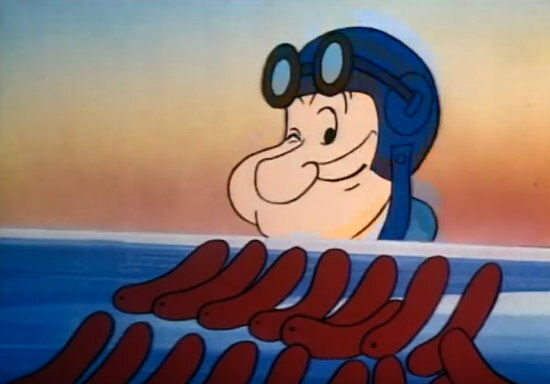 Well, first I was all “oh hey, new Popeye cartoons, cool” before it dawned on me that “oh, wait, there’s an official YouTube channel?” which I had no idea even existed (putting lie to my initial claim that I”m always on the lookout for Popeye news, I guess). 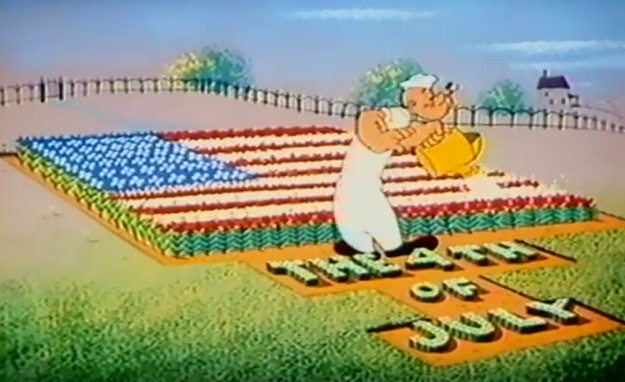 Anyway, there it is, right now mostly heavy on the (relatively) later color Popeye cartoons post-Fleischer Studios, including a number in Spanish and, um, a Beetle Bailey cartoon for a reason not immediately obvious to me (though I suppose there is one if I bothered to look). PLEASE NOTE: THERE ARE TWO EYES. 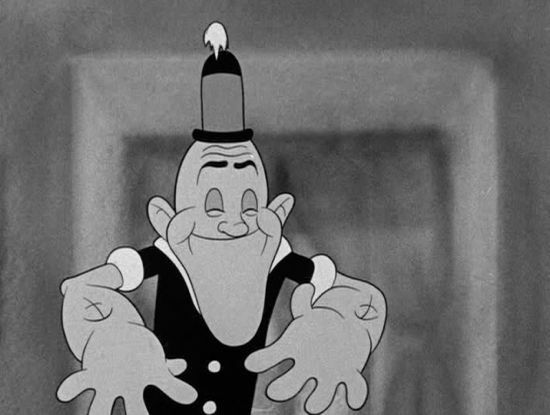 Okay, given the limitations of the animation in question, all we can really determine is that there is a black dot where Popeye’s right eye should be…it could represent an empty, black pit, a hideous scar forever reminding him of whatever unknown tragic incident in his past (this notwithstanding) robbed him of that precious orb. However, I think it’s not entirely unreasonable to assume that it in fact represents an actual eye (otherwise, there’d be, I don’t know, an “X” as shorthand for the missing eye, or more likely not have bothered in the first place with briefly doing away with the squint). 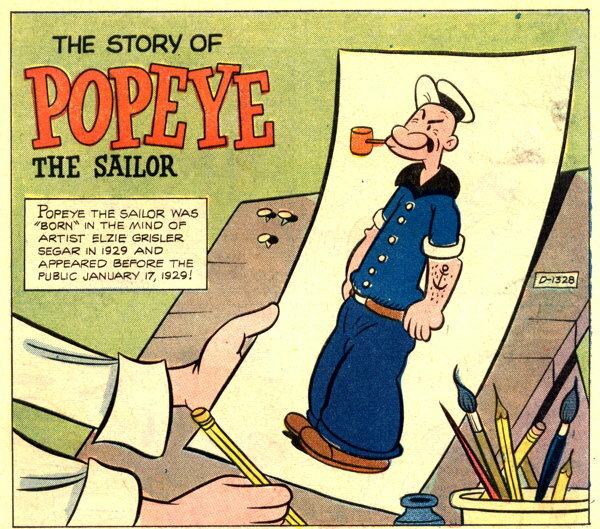 Or maybe it was just a one-off gag done for the larfs, and not some kind of secret revelation that Popeye had maybe a scratched cornea, or a persistent stye, or similar, which is why he just kept that eye shut all the time instead of getting some Visine or even, like, an eyepatch. Anyawy, just thought that was interesting. 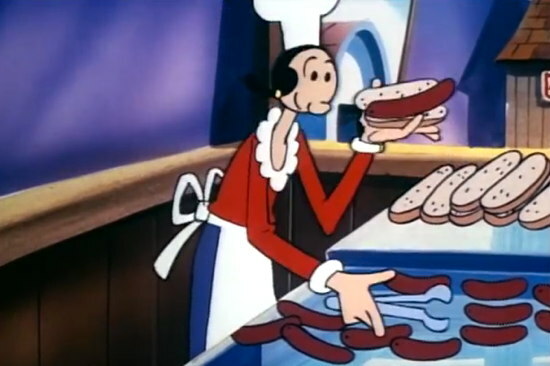 I’ll try to keep tabs on that YouTube channel for when they start cranking out the new cartoons…I’d like to see what they’re gonna do with it. …and it’s just as adorable in person. Yeah, yeah, I know I’ve said before I’m not a Pop! “collector” but occasionally the right one (or, um, three or four, as in the case of the Swamp Thing Pops) comes along and I gotta have it. And yeah, it’s pretty amazing. 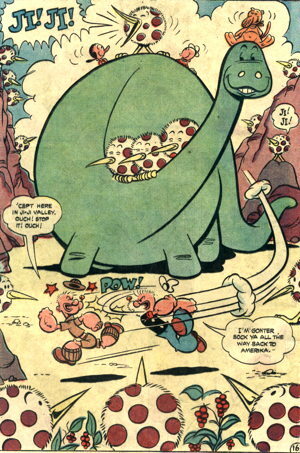 Here’s hoping they eventually get around to Nancy and Sluggo…they seem like naturals for this particular format. 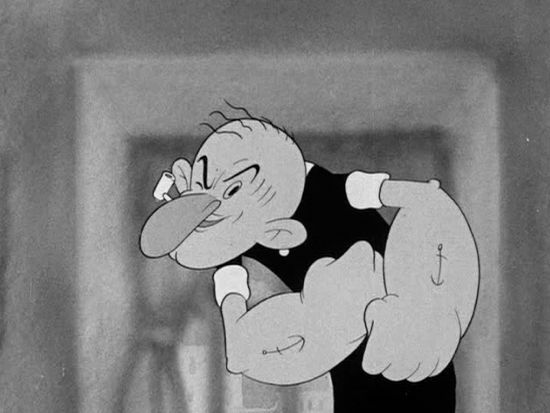 When I die, Saint Peter is going to ask me how much of my life did I waste thinking about Popeye continuity, and it’s not going to go well. 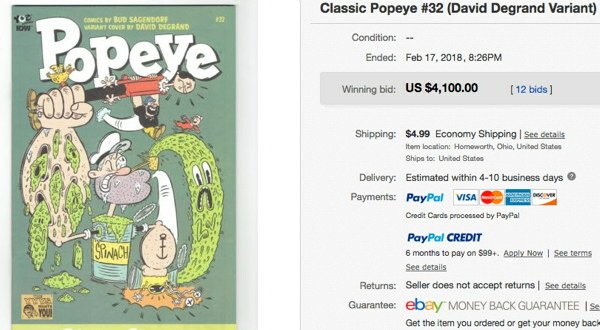 So in a collection I recently purchased for my store (that store being Sterling Silver Comics, located in beautiful Camarillo, CA) there were a couple of really beat-up copies of the 1970s Charlton Popeye comics. I haven’t been actively collecting those for myself, but occasionally they do fall into my hands and, thus, into what remains of the Vast Mikester (Personal) Comic Archives. 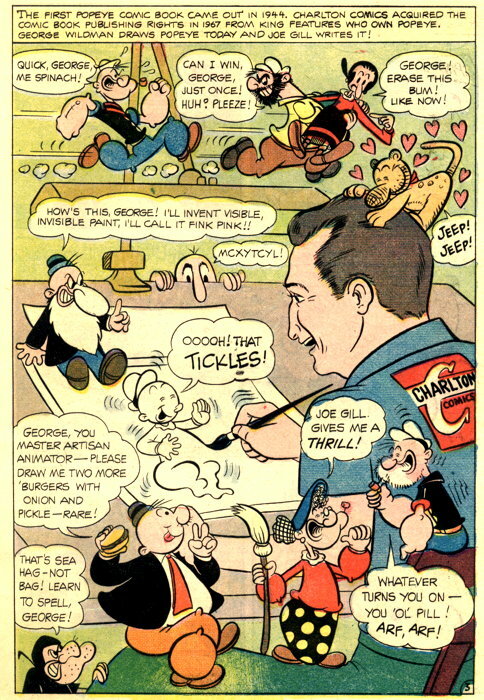 George Wildman was the cartoonist responsible for these particular comics I obtained, and was in fact responsible for most, if not all, of the Charlton Popeye run. (A quick look at the Grand Comics Database listing for the series doesn’t note credits for lead stories in some of the books, but I’m pretty sure Wildman did a lot of them.) Mr. Wildman, by the way, did pass on just recently, and I direct you to this obituary by Mark Evanier. 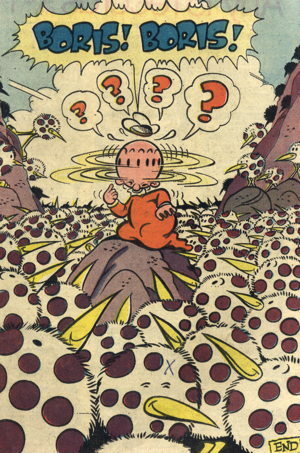 Looks like Mr. Wildman drew a lot of fun comic books, and the Popeye comics of his that I’ve read are just close enough to the original strips to be recognizably Popeye-esque, but usually with a completely bonkers and anarchic feel to the proceedings to make them their own unique experience. Now admittedly, I’ve only read a handful of the Charlton Popeye s, but I don’t recall too many full-page drawings in them. 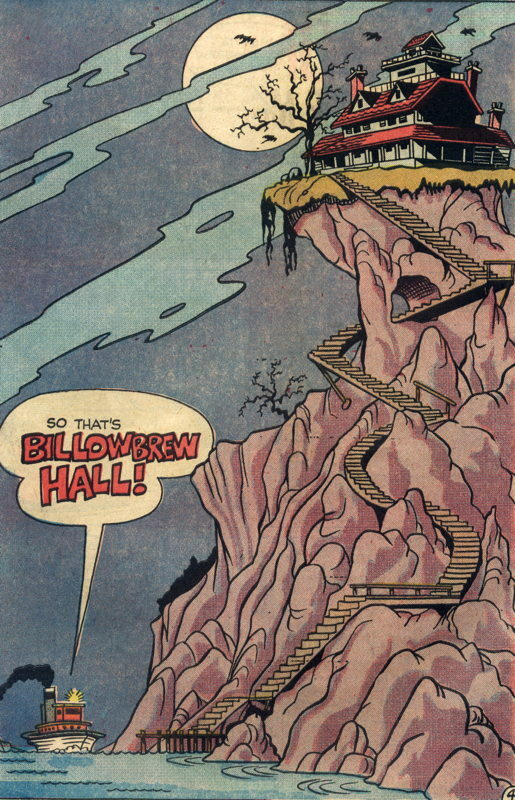 I especially like this one, with its spooky ambience and the stairs winding through the cliffside. It’s the sort of picture I probably would have spent an inordinate amount of time studying and imagining about as a child. 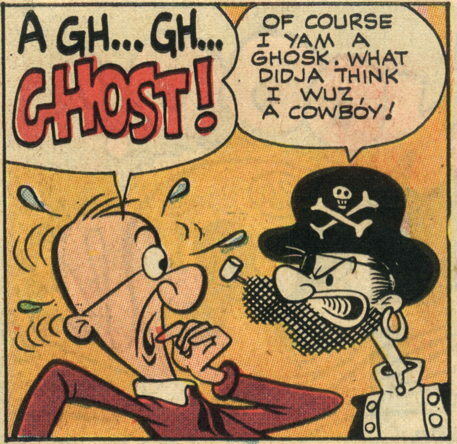 Yes, he’s identified as Popeye’s grandfather, and the fact they recognize each other right off made me wonder where he’s appeared before, since I’m not familiar with the character. 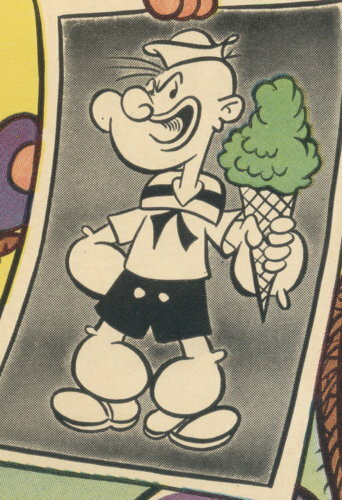 A quick search shows that he first popped up in issue #67 of the Popeye comics from Gold Key, back in 1963…in a story by E.C. Segar’s successor Bud Sagendorf, no less. 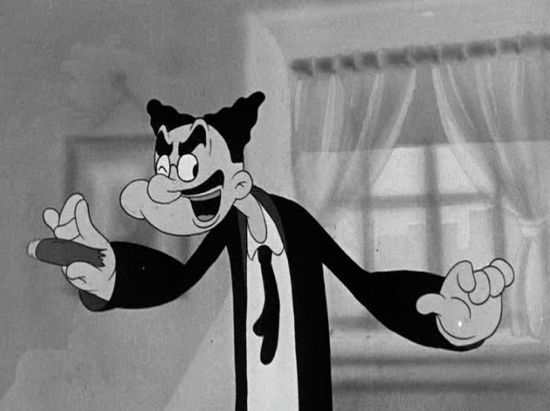 Now, that database listing has Patcheye as Popeye’s great-grandfather, which I think I’m a little more comfortable with, but regardless, if Sagendorf put him in the comic, I will consider that at least B-Level Canon in the Expanded Popeye Universe. 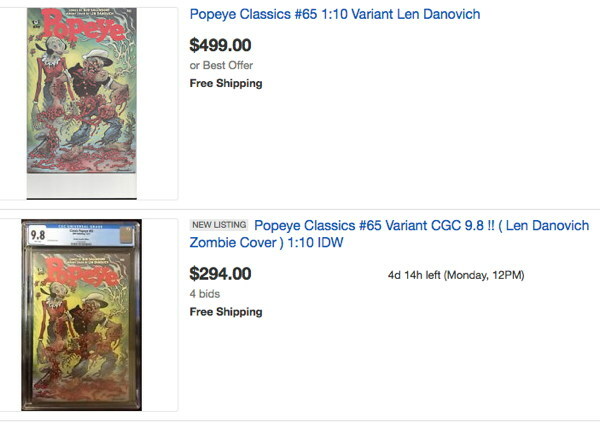 Hopefully IDW’s Popeye reprint program will get this far into the comics so I don’t have to search out the originals! 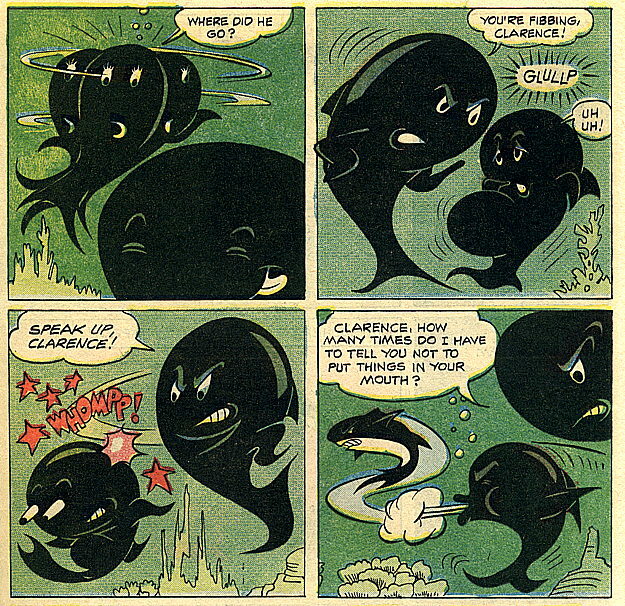 You can see the original strip on this page for comparison. 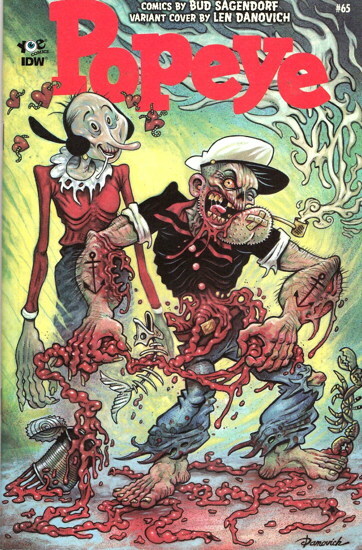 Maybe splashes like this during this particular period of Popeye books were more common than I realized. Clearly the only answer is tracking down all the rest of the issues for myself and doing a complete survey. I’ll let you know how that goes. In which I make a pretty large assumption that there are still kids playing with Groucho glasses. 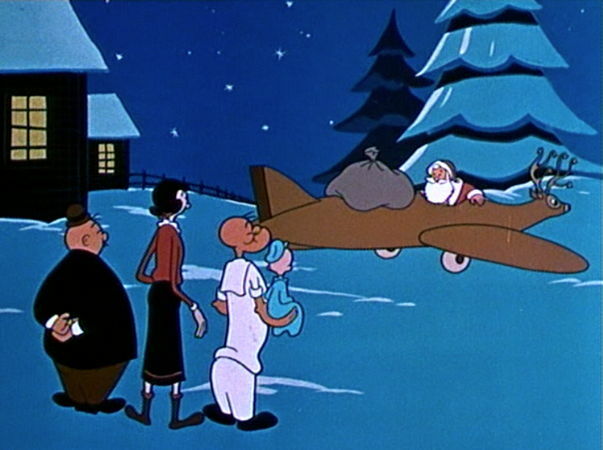 A credit both to the makers of this cartoon and to the immortality of these particular performers that their caricatures here are still instantly recognizable to us 72 years later. Well, most of us, anyway…after finding out a couple of years back that one of my girlfriend’s nieces had never heard of the Three Stooges, and after having one young employee at the shop who’d never heard of Vincent Price, I shouldn’t take anything for granted. I’m sure as generations wear on, general knowledge of these “immortal legends” will increasingly become solely the interest of hobbyists and specialists. …Though I have a hard time imagining that about Groucho Marx. That hair, nose, and moustache…the glasses and cigar. It’s all so embedded in our culture that I can’t see it ever going away, though I suppose it must. I’m guessing kids play with toy Groucho glasses from discount stores even now, without knowing that they’re inspired by a real person. Well, a character performed by a real person…you know what I mean. I’m guessing of all these caricatures, it’s Groucho’s that’ll have the greatest chance of outliving knowledge of the actual man. I can see the glasses ‘n’ cigar becoming…well, continuing to be, since they pretty much are already…a generic symbol of “comedy,” but to the point, maybe centuries hence, where folks just think that image represents the idea of humor, with not one of them realizing that there was once a person who wore those glasses and wielded that cigar. Of course, with the enormous proliferation of reproducible and storable media, it seems unlikely that Groucho and his brothers will be forgotten, but, a thousand years from now, ten thousand, fifty thousand…who knows? Maybe our giant-brained, spindly-limbed descendents will be wearing funny plastic glasses and wagging their cigars at each other, their big fake black eyebrows bobbing up and down, without any idea whom they’re imitating.